Prague, Czech Republic – Walking along the idyllic streets of Prague just blocks away from the famed Wenceslas Square, 38-year-old Palestinian-born Raed Shaikh stopped to point out a halal grocery store he and the handful of other Muslim residents in town frequent.He then motioned towards a Middle Eastern restaurant to the right, hidden behind a small mosque. “Here is the highest concentration of Muslims in Prague,” the IT project manager said laughingly. Though no exact figures exist, the Muslim community in the Czech Republic is small, between 5,000 and 20,000, or less than 0.02 percent of the total population. Just a portion lives in Prague. Yet Islam has become a hot-button topic in Czech national politics, where the power to resolve the country’s hung parliament could lie with a politician whose only policy is, “No to Islam. No to terrorism”. Czech-Japanese entrepreneur Tomio Okamura and his Freedom and Direct Democracy Party (SPD) rode into parliament as the third most powerful party after the recent October nationwide elections, with no discernable policy other than to drive Islam completely out of the Czech Republic. The campaign slogan was convincing enough for the newly formed SPD to scoop significant votes in its first ever electoral race. Related: Can Britain Ever Be Multicultural? Having built ties to other far-right movements in Europe, such as Marine Le Pen’s National Front in France, Okamura hopes to achieve his goal through ongoing coalition talks with controversial billionaire Andrej Babis, who is slated to become the country’s next prime minister. Babis’ Action of Dissatisfied Citizens Party (ANO) won the October elections in decisive fashion, but did not secure a simple majority. Now he must form a coalition with a fragmented parliament that has expressed little willingness to work with the populist agro-magnate who at the time of the elections was being investigated for fraud. Some Muslims in Prague fear that the circumstances may lead to an alliance with Okamura, giving him an unprecedented platform – a worrying prospect given ANO and SPD’s common disdain for Muslim refugees.”We have to fight for what our ancestors built here. If there will be more Muslims than Belgians in Brussels, that’s their problem. I don’t want that here. They won’t be telling us who should live here,” Babis told journalists in June. This type of increasingly hostile rhetoric against migrants has profoundly stoked Islamophobia. For the members of Prague’s small Muslim community, it is a sign of worrying times ahead. “Many of our friends have already left and if [Islamophobia] was not the first reason, it would certainly be the second,” the Palestinian-born Shaikh said. Currently, Islam is recognised as a religion in the Czech Republic but its followers are restricted from several basic privileges enjoyed by other faiths, including the right to establish schools, to hold legally recognised weddings and conduct religious ceremonies in public spaces. “Most of the Muslims here are doctors, engineers and IT specialists and so on, yet some [political] parties…are trying to change our rights and eliminate Islam,” said Vladimir Sanka, a 58-year-old Czech Muslim, who is on the board of the Muslim Community in Prague association. With negotiations between the two parties ongoing, Okamura has already told local media that ANO has pledged to consider a restriction on asylum for Muslims and a ban on Sharia, or Islamic, law, and that SPD will not support Babis unless agreement is reached.Lubomir Kopecek, a political analyst at Masaryk University in Brno, said that an alliance at this stage is unlikely, though, by no means unfeasible. “If an ANO and Okamura government would happen in the next weeks or months, it could change many things,” he said, referring to religious freedoms. Even if the two parties did align, they would have a hard time carrying out such a ban, the chief of the Constitutional Court, Pavel Rychetsky, told local media saying: “Nobody can forbid freedom of religion and belief.” Still, the move would not be unprecedented for the region. 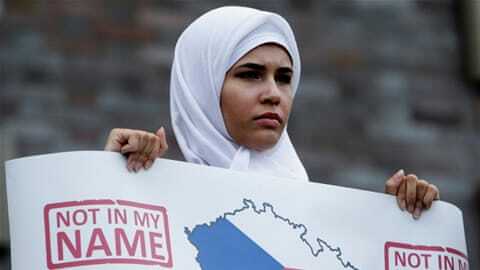 Slovakia last year passed a law effectively banning Islam from gaining official status as a religion. Making matters worse, growing anti-Islam sentiment has resulted in an uptick in hate speech and even physical attacks against Muslims who moved here long before the refugee crisis. In July, local media reported two Muslim women were escorting a group of children to an aquapark in Prague when a third woman began verbally and physically assaulting them. One of the victims was Shaikh’s wife. “It is becoming more and more tough here unfortunately,” he said. Shaikh, who twice debated the issue with Okamura on Czech television in 2015, said it has become difficult for his community to find a place in Prague to gather for Eid al-Fitr – the end of Ramadan celebrations – in recent years. Large halls want nothing to do with Muslims. “It wasn’t a problem for 23 years, but a couple of years ago it became mission impossible,” said Shaikh. Like its eastern neighbours Poland and Hungary, the Czech Republic’s attitude towards migrants soured in 2015 after an escalation of attacks in Western Europe and as the refugee crisis continued to unfold.Despite a very number of Muslims and never having fallen victim to an attack, the perceived threat of attacks paired with a tradition of nativism – for example, the longstanding persecution of the ethnic Romani – has made the country susceptible to populism and far-right attitudes. According to a Harvard University survey published earlier in 2017 of of hundreds of thousands of people in Europe, Czechs exhibited a higher level of implicit racial bias than in any other European country. In Prague, politicians including President Milos Zeman have sought advantage by adopting tough positions on Muslims, standing in fierce opposition to EU refugee quotas, taking just 12 of nearly 2,700 refugees allotted by the European Commission. The stance has led to inflammatory rhetoric with Zeman remarking that Muslim integration in Czech society is “practically impossible”. Such rhetoric has paved the way for anti-Islam groups like Block Against Islam, which is known for staging outlandish events that last year included dressing up in traditional Muslim garb and mocking the Hajj pilgrimage by marching around a portable toilet meant to resemble the Holy Kaaba at Mecca. In a separate event, the group staged a fake Islamic State of Iraq and the Levant (ISIL, also known as ISIS) invasion at Old Town Square that included a mock beheading. “They are a small group, but they want to provoke a reaction and hope that we react so that they can say they told us so,” Sanka said. Exacerbating the issue, the Czech Republic has fallen victim to a destabilising disinformation campaign – widely believed to be perpetrated by the Kremlin – that hopes to see Czechs turn against western-backed democratic politics in favour of illiberal autocrats. In order to do that, dozens of fake news organisations established in recent years have focused on creating a false narrative against Muslims with the goal of herding the populace toward populists. HateFree, an anti-discrimination organisation run by the government has debunked approximately 100 anti-Muslim hoax stories in the Czech Republic over the past few years. “We don’t have the capacity to do much here, but we are still in a very tough position,” Shaikh said of his small community. Eastern Europe has a growing far right. In western Europe their success is minimal but in eastern Europe worryingly greater. It’s going to get worse. Mark my words. Yes. It will get worse.